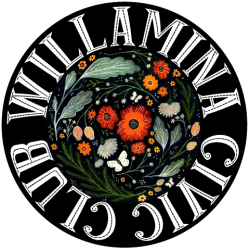 Welcome to the Willamina Civic Club website! We meet monthly at our clubhouse on B Street to discuss projects and ideas for improving the quality of life in our community. Please check the calendar to confirm the meeting dates. Monday April 8th 6:30pm Monthly Meeting at Wildwood Hotel. All are welcome! We welcome everyone (men and women) to join us for monthly meetings that focus on community development and support for it’s citizens. Meetings are held at the “clubhouse” on B Street. Please consider supporting the Willamina Civic Club and it’s endeavors by becoming an active member. Yearly dues are only $10 and you’re welcome to come to as many (or as few) activities and meetings as possible. We appreciate your input and ideas to make the Willamina area an even better place! On Saturday December 16th The Willamina Civic Club will be offering gift wrapping at the Willamina Merchants Holiday Soiree. This will be a revival of a bygone tradition… the Willamina Civic Club bingo night! We decided to put our own twist on it. We’ll be making chili and have beverages available for sale, and the bingo prizes will consist of a variety of delicious baked goods provided by members of the club! Email us at willaminacivicclub@gmail.com or join our group on Facebook!